I’m Candy Feller. 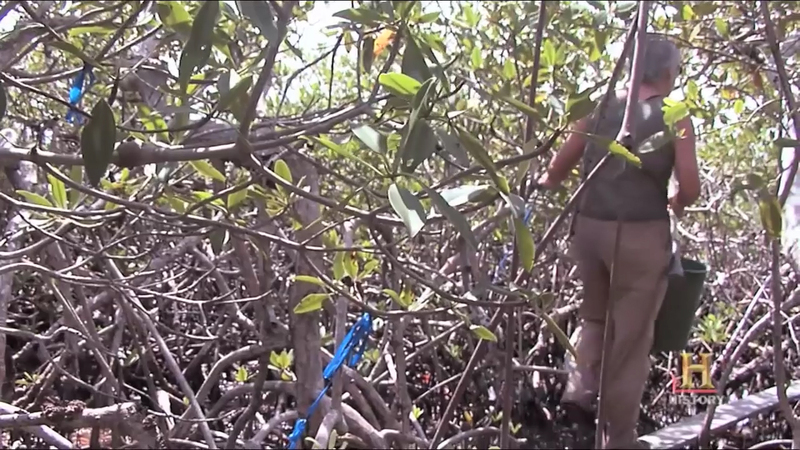 I work for the Smithsonian and I study mangroves in Belize. We are at Cattie Bow Cay; this is the Smithsonian Institution’s marina field station. More than 65 scientists come each year to do research. Well today, we’re going to the mangroves to attend to a long-term fertilization experiment. More and more people are moving into the costal zones, so all the nutrient runoff from residential areas, industrial areas, washing right into these shallow water ecosystems. In this experiment we’re adding nitrogen and phosphorus, two elements that are used in, commercial fertilizers, to see how excess nutrients affect mangrove ecosystems. Mangroves are found around the world in the tropics. They’re critical because they are the nursery of the sea. Baby fish live and grow up in these waters. They protect the shoreline from tropical storms and waves. They filter runoff that would otherwise get out to the coral reef. I’ve fallen out of these trees, impaled myself. So trust me, you can hurt yourself. This is where my fertilization experiment is. I’ve got three treatments out here: control, a nitrogen-fertilized, and a phosphorous-fertilized. We give these trees just small doses of fertilizer and then track them over the long term. Each of these has about 150 grams of fertilizer in it. So then I take my fertilizer and just put it back in the hole that I took out there. I stuff the peat right back into that hole. We’ve been working since the mid-80s. There’s lots of ramifications of nutrient overenrichment. Adding nutrients to these trees has ripple effects into the has marine food webs. The fish that would use these mangroves as nurseries or feeding grounds… that habitat’s been destroyed. So the nutrient runoff into these adjacent coral reef systems… if you add nutrients to coral reefs, coral reefs go away, you get an algal reef. So it’s just a snowball of things. And it’s not just nutrient overenrighment that’s affecting mangroves. It’s estimated that 50% of the world’s mangroves have already been cleared and some people even predict that mangroves will be extinct in 100 years. As a child, I played in a swamp near my grandmother’s house. And I was… it terrified me and excited me all at the same time, and I still do the same thing today.